This April is all about strings. 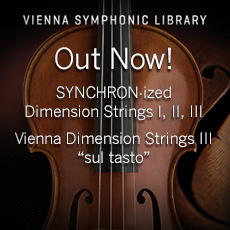 In addition to major discounts on all Synchron and VI String libraries, Vienna Symphonic Library introduces new Dimension Strings products at introductory prices. Please allow up to a working day for delivery of personal VSL Up- and Crossgrade licenses/activation codes. This Collection features five string ensembles that were exclusively played “sul tasto”, as opposed to “con sordino” (with mute). This special playing technique is characterized by placing the bow near the fingerboard, resulting in a lack of (even) harmonics and a very soft, breathy timbre, similar to that of a flute playing in pianissimo. The sul tasto articulations include staccato, détaché, sustain, tremolo, tremolo with fast attack, tremolo slow, sforzato, legato, portamento, legato repetitions and spiccato repetitions. The Synchron Player’s ability to gradually increase the number of players opens all-new possibilities for starting your arrangements “dal niente” (from nothing), or to fade out a note to little more than a bare whisper (“al niente”). By adding the ambience of Synchron Stage Vienna to the relatively dry samples in real-time, SYNCHRON-ized Dimension Strings III perfectly blends with every other product in the Synchron Series, resulting in a beautiful, production-ready sound “out of the box”. The string players of SYNCHRON-ized Dimension Strings III were recorded in homogeneous groups, capturing all of the human interactions and slight imperfections of a live performance. Individual microphones for each player allow you to access each voice of the ensemble individually. Making use of the new Synchron Player, SYNCHRON-ized Dimension Strings III offers a wide variety of articulations, organized in the player’s clearly laid out structure, and is therefore easy to navigate and to play. You may easily switch between any number of musicians of the ensembles in one instance of the Synchron Player, from the principal to single desks to the full ensemble size. What’s more, you can automate the integrated mixer and therefore control the volume of each player separately. Each ensemble instrument has its own Synchron Stage Impulse Response for placement and reverberation, so it’s a breeze to use each Dimension Strings ensemble in one instance of the Synchron Player. SYNCHRON-ized Dimension Strings III comes with the free Vienna Synchron Player that incorporates the most powerful sample playback engine on the market. The new “Dimension Tree” structure lets you easily and intuitively access all available articulations as you play. The player comes with a specifically designed convolution reverb derived from Vienna MIR Pro, featuring the outstanding and unique ambience of the 540 m² (5,813 sq.ft.) main hall of Synchron Stage Vienna. The perfectly engineered reverberation and placement presets for each ensemble and even for each musician of the ensembles combine customized impulse responses with expertly crafted reverb settings for a beautifully balanced sound. Vienna Instruments require the ViennaKey! This USB protection device by eLicenser (by Steinberg, formerly Syncrosoft) is not included in any collection, it is a separate item you have to get additionally. So you’ll have to order at least one ViennaKey with your first purchase. It will be put inside the shopping basket automatically but can be deleted if not required. Customers who order the complete SYMPHONIC CUBE will get one ViennaKey for free (not shown in the basket). If you already own another eLicenser USB protection device (e.g., from Steinberg or Arturia), you can use it for the VIENNA INSTRUMENTS, too. Each dongle can store up to 100 product licenses. Additionally an internet connection on any computer is required to authorize a VSL product.